As international teachers, we are lucky to attend professional development courses in other cities. We decided to make a weekend of it as Seoul is only a three-hour train ride from our home in Busan. It is always nice to get away, even if just for the weekend. 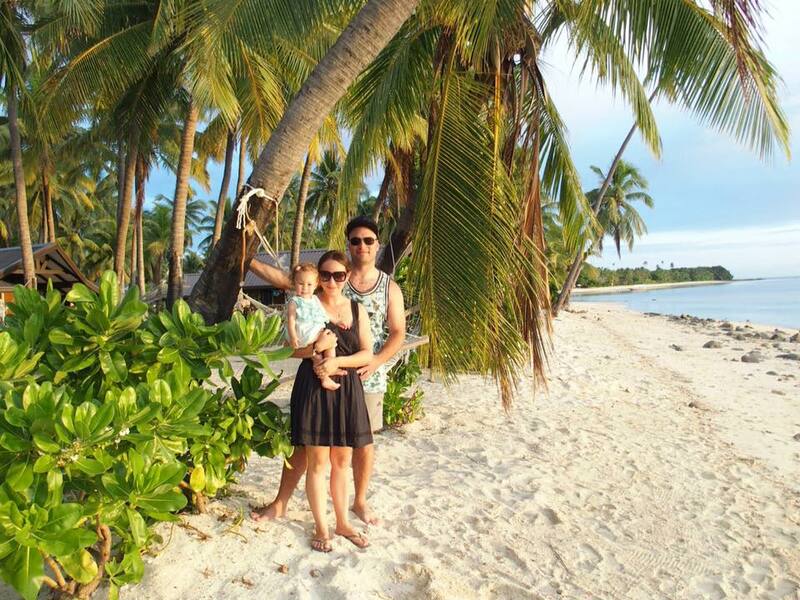 We are already thinking of our return so we will definitely add to this post when we go back. Bukchon Hanok Village- The traditional houses here are still lived in and the view back to Seoul from the top is beautiful. We had seen this view quite a bit before visiting and wanted to check it out. 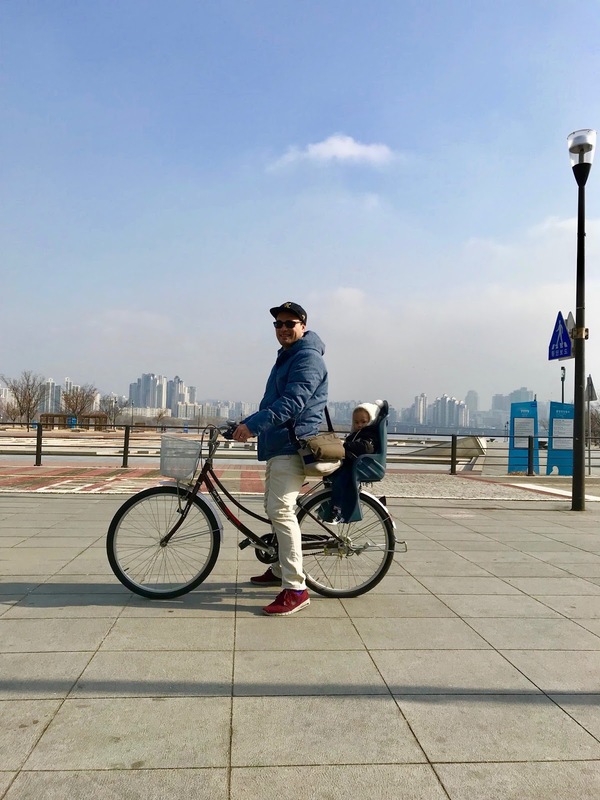 Biking around Yeouido Park- Such a fun thing to do on Saturday morning, joining in with the locals relaxing and exercising in the park. It is situated along the river with views of the city. 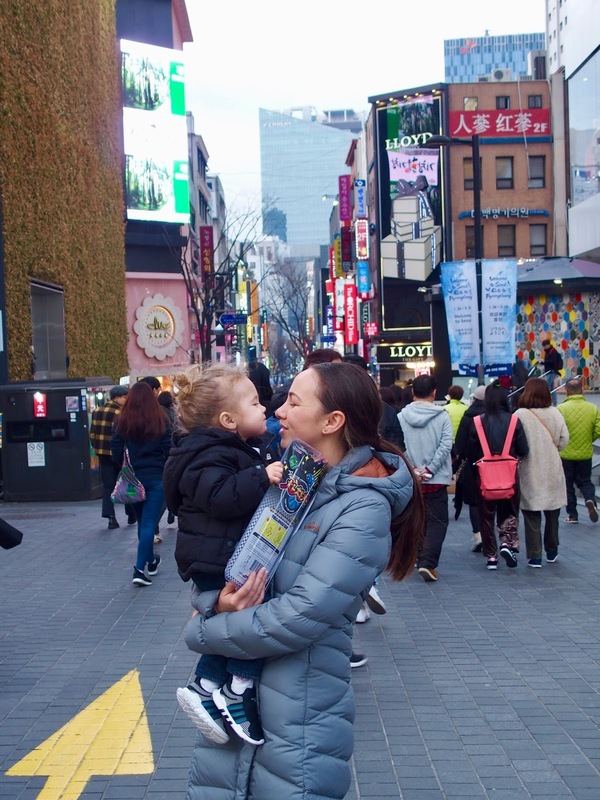 Myeongdong- Great for shopping and street food! A lively and fun atmosphere and the food is amazing! 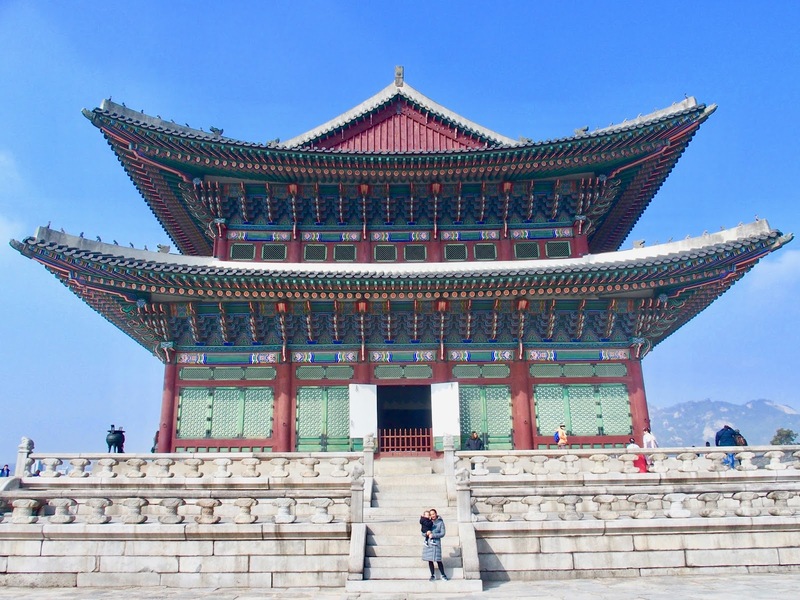 Gyeongbokgung Palace- The former palace and quarters from the Joseon dynasty built in the 14th century. 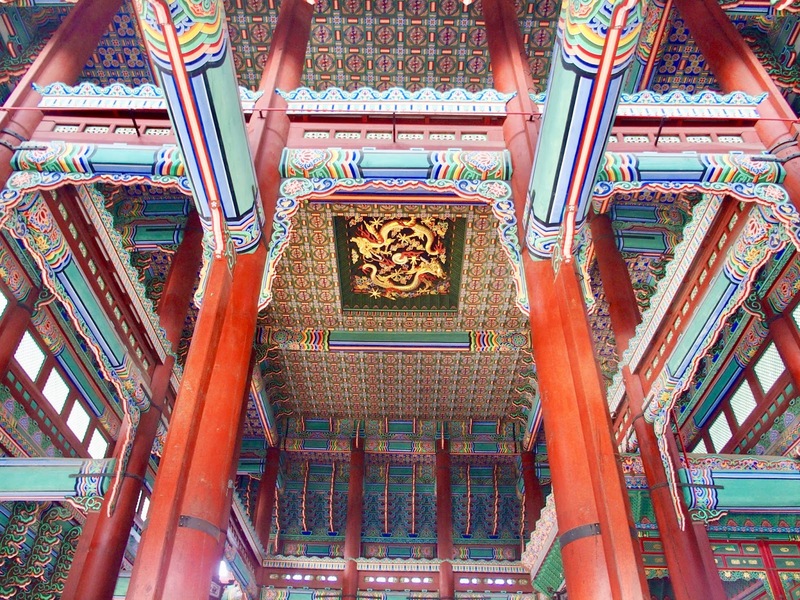 It is very grand and beautiful, and really interesting to visit after seeing similar style temples in Busan and Jinju. Over 100's of years the grounds have been destroyed and rebuilt due to various wars. Namdaemun markets- Very popular markets in Seoul. It is probably the largest market area we have visited, and you could spend a few hours here shopping and eating. The food is authentic and delicious. We didn't shop much here but there are a lot of market-style stores. There is a wall nearby which was a traditional entrance to the city. 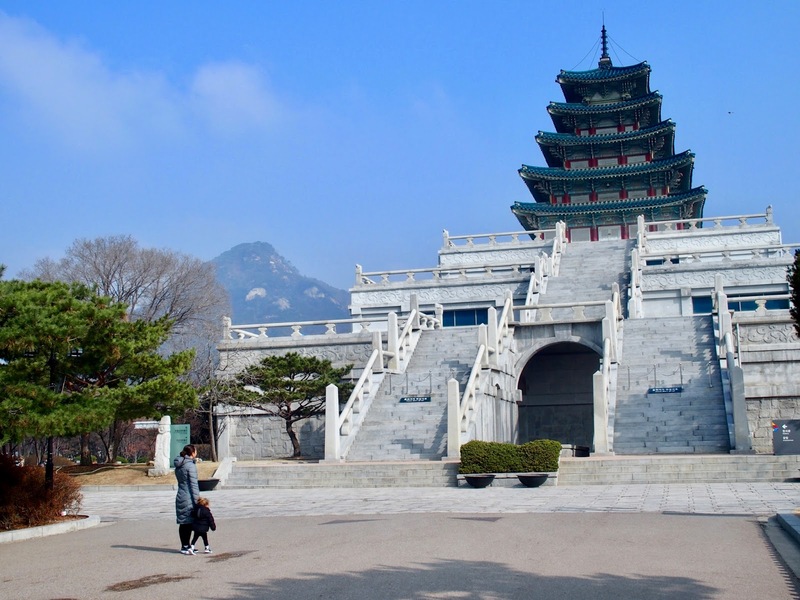 When we return to Seoul we also plan to see the war memorial, Namsan tower and possibly look at day tours to Nami Island and the border experience with North Korea. Autumn (end of October) and Spring (early April) are great times to visit Seoul and Korea in general, for autumn colors and cherry blossoms. April-May and September-October the climate is warm and not too hot. The KTX is a very convenient way to see Korea. We love how regular and fast the trains are and how you are able to change your tickets for no cost (or very little) at short notice. The subway systems are also easy to use, clean, and efficient. Our friend recommended that we eat at The Original Pancake house in Itaewon for brunch. There was a 45-minute wait so be sure that you are prepared for this if you want to go. Unfortunately, we were on our way to the train station so didn't wait. You could easily kill some time shopping while you wait. We did, however, choose to go to the Indian next door called Agra and we were not disappointed! Other food recommendations from friends who regularly visit include-Manimal (smoky bbq) and Vatos (Mexican) in Itaewon, Brooklyn Burger in Gangnam, Bills for brunch located on Summer Lane between Itaewon and HBC. 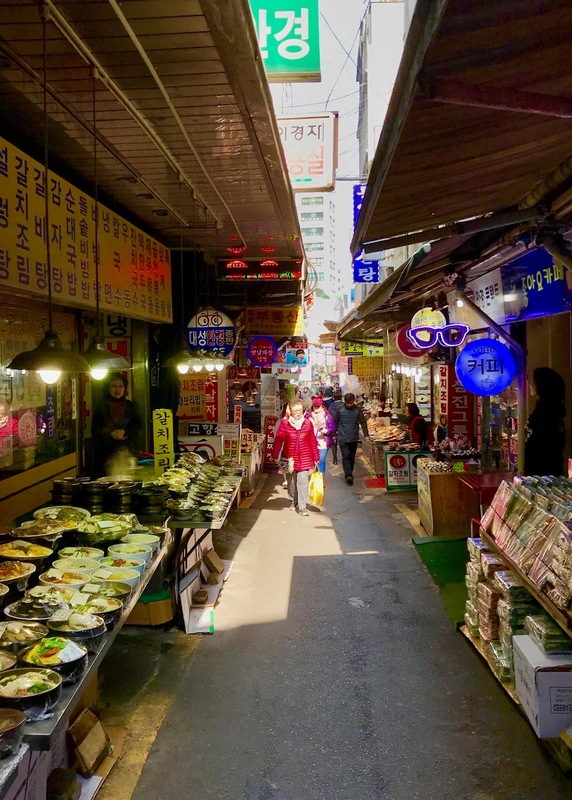 Many people recommended the Itaewon district in general for good places to eat. It was nice to walk around the Hanok Village and Gyeongbokgung early as they are popular places that get crowded. We did come across a couple of traditional tea houses but unfortunately, they didn't open until 11am. 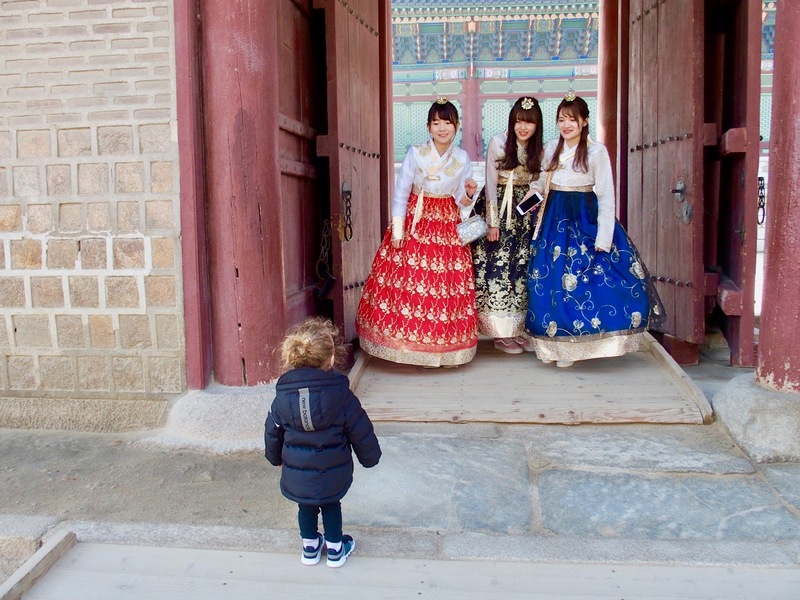 We began at the Hanok Village and walked down to the palace which was easy to do. 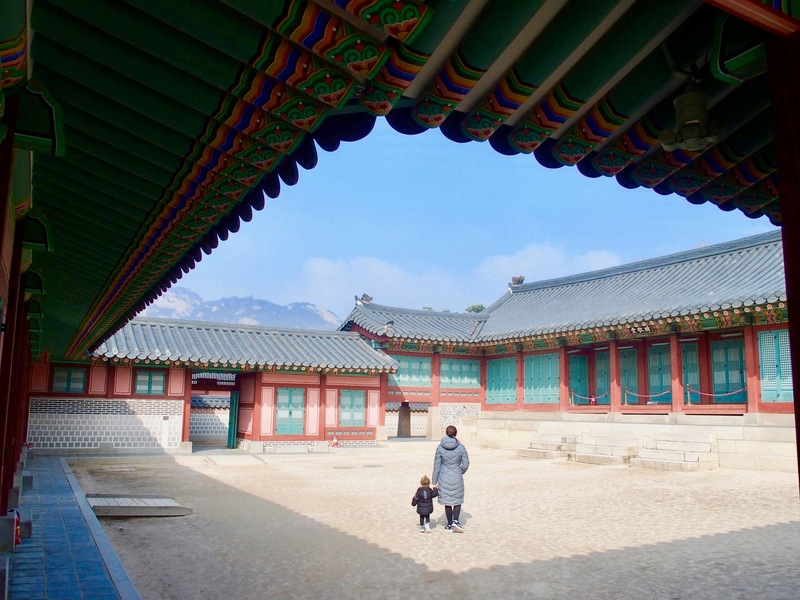 You can see the Hanok Village quite quickly and can spend 1-2/3 hours at the palace depending on how much you want to see and whether you would like to do an organized tour. An hour was enough for us with Lilah. We find taxis really easy to use with Kakao Taxi (a Korean app similar to Uber where you can pay at the end of the ride). We use it a lot in Busan. It is great as you can drop a pin, which can be easier than trying to communicate with a driver who doesn't speak much English. They are also very reasonably priced! There were a lot of art and craft shops down the main street in Insa Dong which is worth checking out. We stayed near here at The Makers hotel, which was modern with excellent service, located adjacent to a subway stop, and they included breakfast. Very convenient for a short visit. 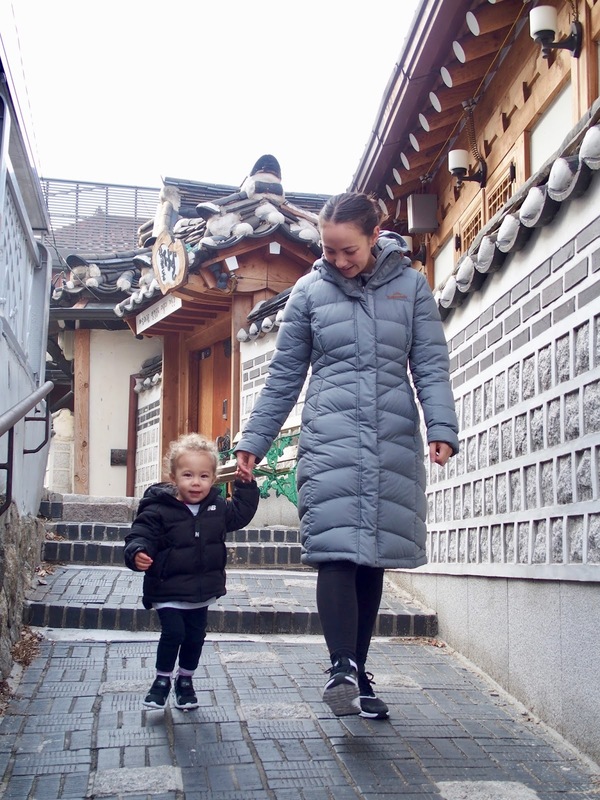 Lilah enjoyed visiting Seoul and loved running around the palace grounds. She is at an age where she likes to eat everything that we eat so that has been handy. She absolutely loved the street food! One thing that we are learning very quickly is that we always need to have plenty of snacks ready for her when we venture out. She is growing fast and seems to need to snack more frequently than we do. A 'hangry' toddler is not much fun at all. Most convenience stores in Korea have bananas and they are cheap so they have been our emergency go-to. 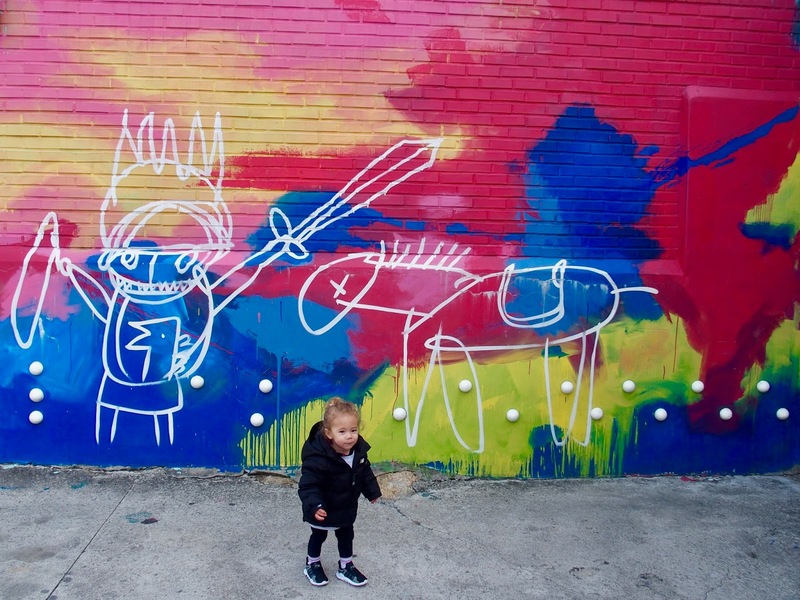 The streets are generally easy to navigate with a stroller. However, we didn't use it much as Lilah likes to walk now. It did come in handy however for her to nap in at the markets. As mentioned above the subway is convenient and easy to use in Korea. Taxis are very reasonably priced so often we will choose to get one with Lilah. One thing we have found extremely frustrating though is that most of the drivers accelerate and break so much that you can be left feeling carsick. Thankfully this has only bothered us and not Lilah yet. 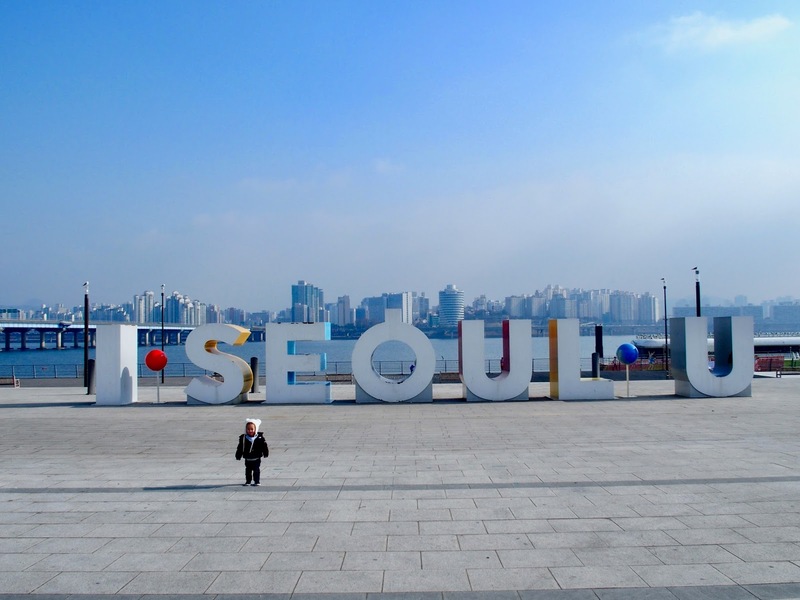 Having just returned from a holiday in Seoul, I enjoyed your blog. It is good to hear someone elses story. Glad you enjoy Busan, we will visit there one day. This time we went to Yeosu and I can recommend a trip there. Thanks for the feedback! Let us know when you make it to Busan :) We are working on a blog post too. Just had a small look into Yeosu, looks beautiful! We will have to vist!